Master Water Stewards are a growing team of trained volunteers who are helping watershed districts and cities make positive impacts across their neighborhoods by demonstrating sustainable landscaping practices, encouraging their neighbors to take actions to improve the water quality of local lakes, and helping local communities implement ways to reduce runoff and conserve water. Recruitment for next season’s class of Master Water Stewards is now underway, and classes begin in October. If you are passionate about clean water and want to make a difference in your community, Master Water Stewards could be the program for you. 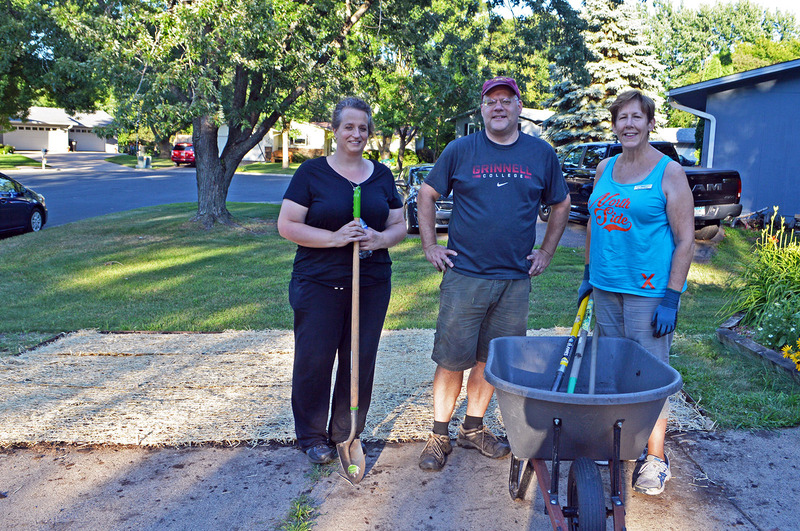 In mid-July, Master Water Stewards Paul Gardner (Shoreview) and Rachel Hanks (St. Paul) teamed up with Ramsey County Master Gardener intern Amy Jacky to install a bee lawn/alternative turf demonstration project in Gardner’s front yard. This is not the first project that Paul has initiated in his community. For his 2016 Master Water Stewards capstone project, he organized a distribution of 100 rain barrels in Shoreview while providing homeowners with installation advice and consultation. L-R: Amy Jacky, Paul Gardner and Rachel Hanks show off Paul’s newly completed bee lawn demonstration project in Shoreview. The alternative turf project in Paul’s yard is the next step in his efforts to model the conservation of water, provide pollinator habitat and reduce runoff in his suburban yard. The eight rain barrels and multiple rain gardens already in his yard further attest to his commitment to protect water resources. Master Water Steward Rachel Hanks helps Farnsworth fourth graders adopt drains near their school. Last year, Master Water Steward Rachel Hanks and her partners, Bill Cranford and Phyllis Webster, initiated the Adopt-a-Drain program as their capstone project in the Phalen Heights area of East St. Paul. They reached out to over 700 households in the Lake Phalen neighborhood to identify residents who would commit to clearing leaves, dirt and trash regularly from storm drains near their homes to prevent pollution from flowing into nearby Lake Phalen and the Mississippi River. 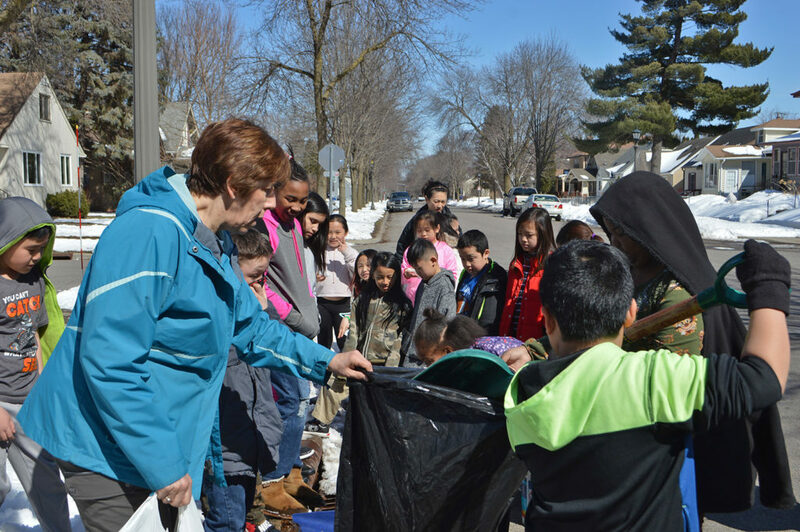 This year, Rachel got Farnworth School involved in Adopt-a-Drain and engaged L’Etoile du Nord School in doing outreach for the program in the Beaver Lake neighborhood in St. Paul. Freshwater developed the Master Water Stewards program in 2013 to help citizen leaders build the knowledge and skills needed to encourage residents to improve water quality at the grassroots level. Master Water Stewards participate in online and in-person classes, develop a capstone project and then continue to volunteer and work on projects in their watersheds. This will be the fourth year Ramsey-Washington Metro Watershed District is participating in the program. Attend an information session from 5:30 to 6:30 PM on Tuesday, August 14, at Harriet Alexander Nature Center (2520 Dale Street N., Roseville) or Tuesday, August 28, at Washington Conservation District (455 Hayward Ave N., Oakdale). 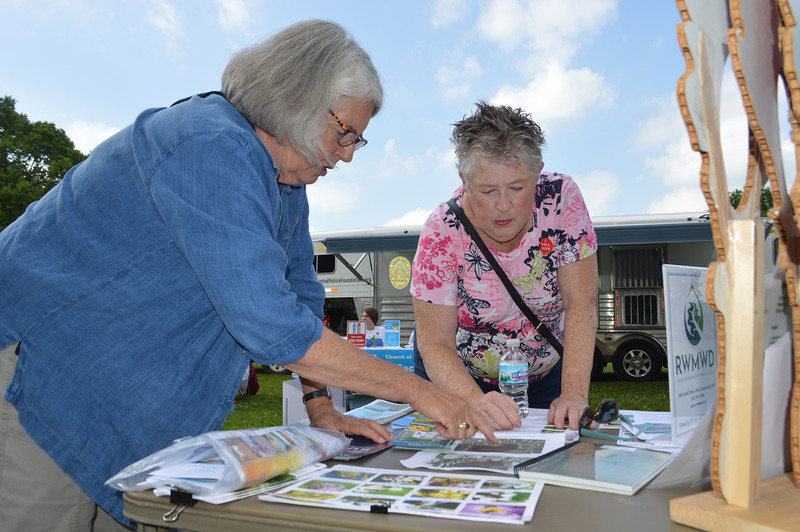 Master Water Steward Chris Strong (left) provided landscaping ideas for residents at a District 2 community event near Beaver Lake.